This is a simple one but worth sharing. 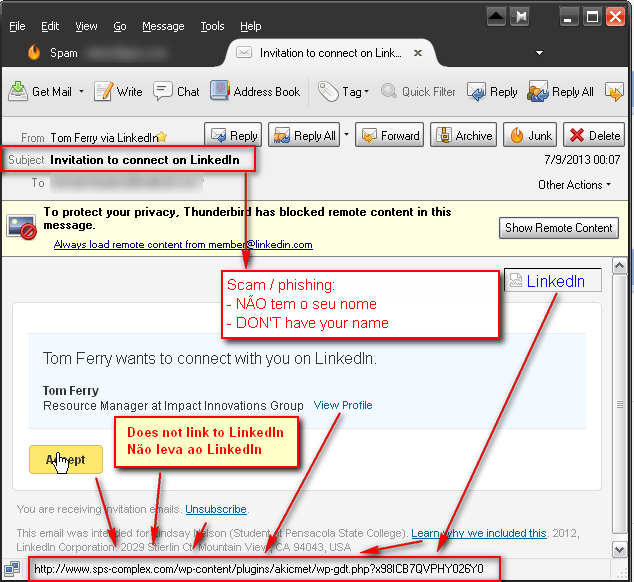 I've been receiving these fake LinkedIn invitations in my e-mail, which contain links to sites with scripts and all the what-not to steal passwords, install Trojans, or whatever. I soon figured out that these scams do not contain my LinkedIn name in the subject. That is, while a real LinkedIn invitation had the user's name in the subject ("Bill, please add me to..."), the fake ones do not ("I would like to add you..."). Of course they don't have your name - they're just automated scams. So it's easy enough to create a filtering rule in your favorite e-mail client to send these scams directly to trash (something like: sender contains "LinkedIn" and subject does not contain "My Name").